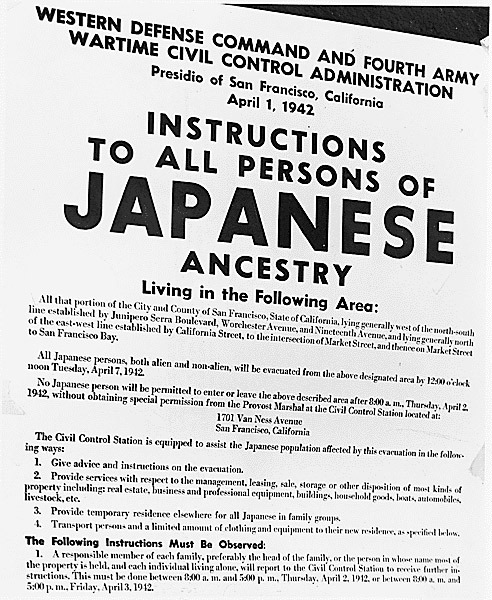 After President Roosevelt signed Executive Order 9066 on February 19, 1942, giving the United States military authority to relocate civilians from coastal communities in the Western United States to inland internment camps, posters like this appeared in towns and cities. Japanese residents, even those who were U.S. citizens, were evacuated. The disruption was tremendous, and each year Japanese Americans recall that chaotic period by commemorating February 19 as a “Day of Remembrance.” Relatively new information has emerged about an internment facility for Japanese located on then-Fort Richardson, now JBER. Local events are planned in Anchorage on that date this year. While this trauma played out among Japanese families up and down the west coast, it had additional significance in Alaska, where more than 800 Aleuts were forcibly relocated from their Aleutian Islands villages to Southeast Alaska locations. Also, villagers from Attu were detained by Japanese forces and relocated to prisoner-of-war camps in Japan. Suffering was immense. Learn more about both aspects of these tumultuous World War II events on today’s program. Your questions and comments are always welcome. Feb. 15-16-17, 2019: “An American Dream,” Anchorage Opera, @ Sydney Laurence Theatre, PAC. Feb. 19-26, 2019: Out of the Holocaust: Sugihara’s Visas for Life, photo exhibit, Loussac Library. Opening Ceremony Feb 19, 6-9 pm Wilda Marson Theatre. Short documentary: Sugihara Survivors: Jewish and Japanese, Past and Present. LIVE: Monday, February 11, 2019 at 2:00 p.m.
REPEAT: Monday, February 11, 2019 at 8:00 p.m.